Hey there! Can you believe it's December 1st?! I can't either. 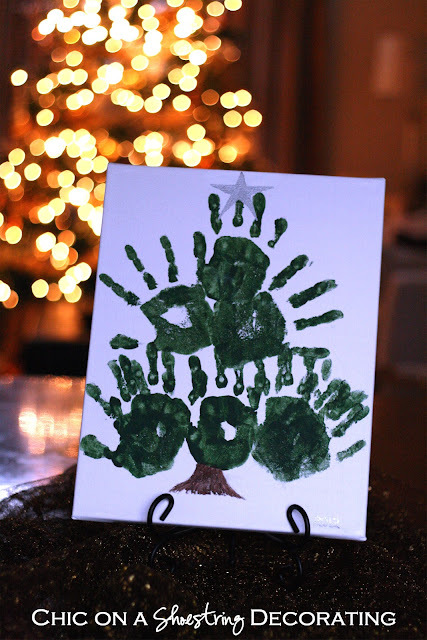 Since Christmas will be here quick I thought I'd share this cheap and easy Christmas craft you can do with your kids... hand print Christmas trees. This is a great craft because not only is it easy and inexpensive but it also makes a sentimental keepsake you can display every year. Your children will love to check each year to see how much their hand has grown since last Christmas. This craft is pretty cheap and that's a good thing since budgets can be tight around this time of the year I happen to have a stash of craft paint and brushes. I already had the canvas, it came in a pack of two and I only used one in a previous project. You can get them relatively cheap at craft stores with a coupon and they are often on sale for 50% off. You could also do this on construction paper if you want to save a few bucks or let each kiddo do their own tree. I decided to let my boys share since I have so many Christmas decorations already I'm not sure if I could find space for two! Cover your work space in case of accidental paint messiness or if it's nice out, go outside. We had an unseasonably warm day so the kiddies and I took advantage and headed out on the back patio. Since both boys were going to use the same canvas we did one at a time to avoid painted hand print high-fives and other potential messes. This is where things can go very bad very fast! Make sure to give age-appropriate instructions warning them to not touch anything with their paint hand. My guy is still little enough that I did not let go of his wrist as he can not be trusted with a hand full of paint. If your kiddo is little like mine, do NOT let go! I repeat, do NOT let go!! Now it’s time to bust out some old dance class moves and show them how to make a one-handed jazz hand. Demonstrate how to use their jazz hand to make a stamp on the canvas, make sure to tell them to pull their jazz hand straight up as to not smear their hand print. Since we were using two boys for one canvas I helped my little one make 3 prints across the bottom to be the base of the tree. I then had him make a print at the very top. After successful hand prints and still not letting go of their little wrist we went straight to the sink to wash off the paint. My older boy is much more trustworthy (most of the time) so we painted his hand and I told him where to stamp it. He has the middle row two hand prints. In hindsight I would've had my little guy face his fingers facing more outward toward the edge of each side of the canvas on the bottom row. This would've filled the space better instead of the doubling up of the prints on each end. I then painted a little brown tree trunk at the bottom after I realized that I probably couldn't paint a bunch of presents that actually resembled presents. This was going to be an outdoor Christmas tree. If you can handle painting the presents I say go for it! Even a person who is totally lacking in artistic painting abilities could pull off the tree stump. I ended up using a silver Sharpie to make the star on top. I can draw much better than I paint and the silver ink has a painted on appearance when dry. The silver marker worked awesome and covered up the green paint completely where it needed to. I decided to display it on a plate stand but it can easily be hung on the wall if I switch up my decor next year. The boys are so proud to show off their hand-made (pun intended) art work to all of our guests who graciously act very impressed. 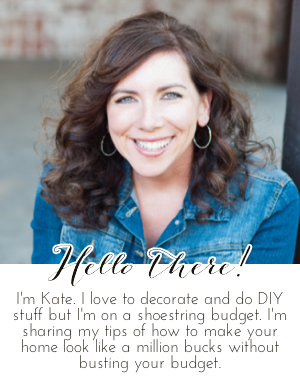 This project is on our to do list this holiday season as well! I have 3 boys so this could be interesting! Love this! 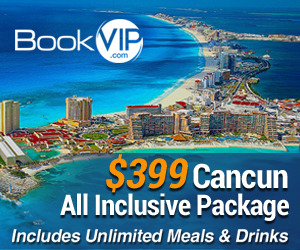 I think I will be adding this to our Holiday to do list! Thanks for the idea!